Triveni Sangam is the place where three rivers confluence. It is considered as a very holy spot in Sanatana Dharma(Eternal Dharma) as a dip in the Triveni Sangam is believed to wash way all sins. Prayag(also known as Allahabad) in Uttar Pradesh where three rivers - Ganga, Yamuna and Saraswati(invisible river as locals say woh dikhta nahi saab in Hindi) meet is such a pilgrimage center for devout Hindus. My visit to Prayag was a short one but it was vibrant within that short duration. On my official visit to Allahabad, with my colleagues I jotted down a plan to visit Prayag. Prayag is the place, where one of the biggest congregations in the world happens during the Maha Kumbh Mela, which is held every 12 years. Long bridge over River Ganga : First thing I noticed when I reached Prayag, is the long bridge over River Yamuna. That is the longest bridge(which is 1510 meters in length) I had ever seen in my life and I was amazed to see the width of the holy river. This sight for me was frightening too imagining the wrath of the natural forces when it unleashes. You will also feel so small in front of the gigantic nature. Just thinking that this is the place where close to 3 crore people gather on a single day of Maha Kumbh Mela is enough to give you goose bumps! (Combined on all days of Maha Kumbh Mela, 12 crore people take a dip in the holy rivers). During that time, river basin would have dried up accommodating such a huge crowd for the ritual bath(Shahi Snan) at the Sangam. 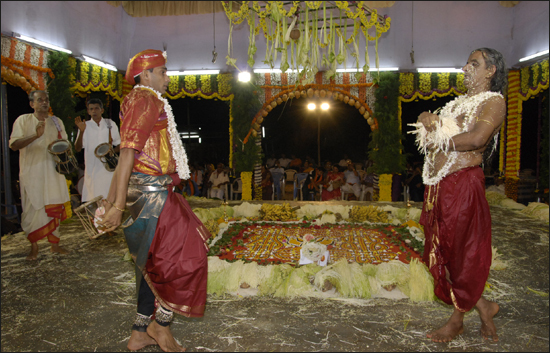 Rituals at the Sangam : It is said that one has to offer a coconut, one for each river for the well being of the family members. Needless to say this was explained to us by the boatmen. One has to pray and offer the coconuts at the place, where the three rivers supposed to meet. For reaching that spot, one has to take a boat. Hiring a boat here can be tricky. Once the rowers find out that you are a visitor, rent can be hefty. As it was in the evening and we had to rush to our hotels, we negotiated with one of the boatmen and sailed to the Sangam! The boatmen told us to observe the difference in the water where the rivers meet but we could not make any difference! Few of us including me decided to do the rituals and offered the coconuts(which were with the boatmen) one for each river. As soon as we dropped the coconuts in the river, boatmen were quick to get it back and restore them to other set of pilgrims lest they could float away. I was startled by their behavior. But then I thought though for us, it was so sacred; it was a routine task for the boatmen! Shankar Viman Mandapam : On our way back to the banks, we noticed a temple glowing in the dark, the Shankar Viman Mandapam, the three storied temple built in Dravidian architecture style. Then we noticed from distance the Ganga Aarti, the daily ritual worship of river Ganga on the banks, with the priests holding brass lamps and chanting Sanskrit shlokas. We left Prayag soon after, planning our next day visit to Varanasi Kashi Vishwanath Temple! Thank you very much for beautiful pictures and details of Triveni sangam. .